Yesterday I was lolling about the harbor of St-Martin, sitting on the thick limestone walls near the little lighthouse, just hanging out. It’s a great people-watching spot. Anyway, at some point I noticed that in the park there was a guy who had a bunch of donkeys and kids were getting on the donkeys and riding them in a little loop around the park. Okay, no big deal. Lots of parks have horse rides for kids, right? Here in France they do donkeys. Same-same. 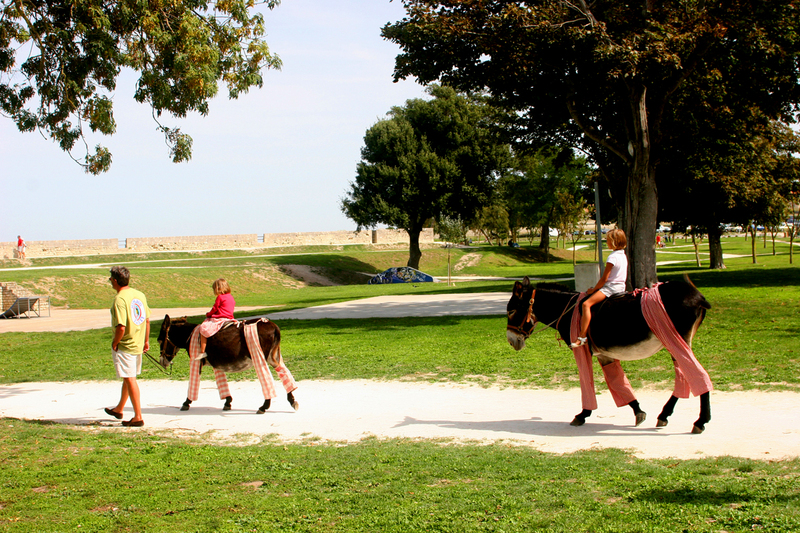 These are a special type of donkey called Baudets du Poitou, a type of purebred (is that even possible with donkeys?) island beast of burden used in the fields of Île de Ré a hundred years ago. And the reason they wear pants is because of the salt marshes, where nasty flies and mosquitoes were so abundant. The gingham pants were designed to protect the donkeys from insect bites. I wonder how long it takes a donkey to get dressed in the morning? And do donkeys put on their pants one leg at a time? My French is not good enough to ask Régis these questions. But one does wonder. Having decided late in the afternoon that dinner was out of the question, that I needed to purge my body of its salt-infused diet, that it would be good for me to take a break from all things liquid related, including wine, I find myself inexplicably hungry at 7. So I compromise with myself by riding my bike to Ars near sunset and ordering a snack at Bistrot de Bernard—a dozen oysters, a risotto of langostinos, and a half bottle of wine. Well, what did you expect? 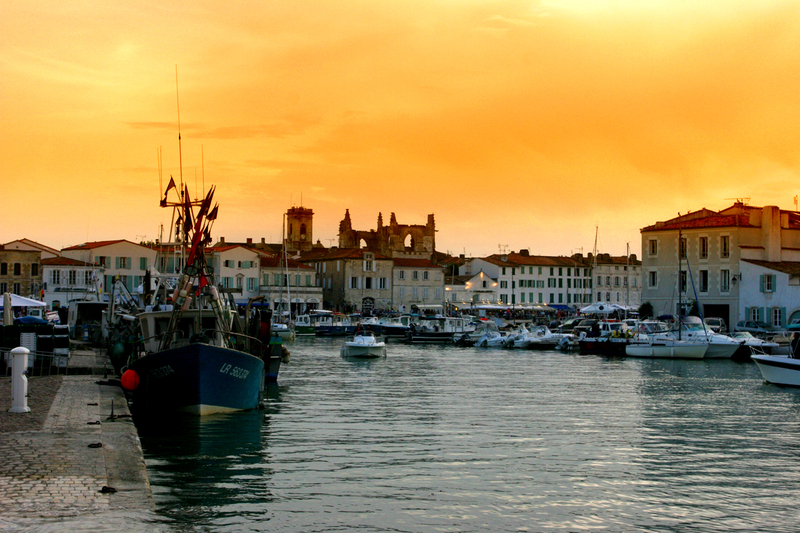 There are no villages on Île de Ré named St.-David, in my honor, nor will there be after my visit. Ars is quieter than St.-Martin. In the cafes and bistros, voices are as subdued as the rust-colored light at dusk. The oysters are marvelous but I’m not happy with the wine, some cloying rose from Aix-en-Provence. I am forced to order another demi-bottle of the island rose, chiding myself for not knowing better. To keep the wine company, I order an assorted plate of cheese. Suddenly it’s dark out. My bike ride home is, shall we say, interesting (can you get arrested in France for being intoxicated on a bike?). But the bike path glows from the reflection of a full moon guiding me like a lighthouse beacon to safe harbor. Eventually I find my way home and lie in bed, iPod stuck in my ears, listening to Joni Mitchell’s “Paprika Plains” (I’m floating into dreams/I’m floating off/I’m floating into my dreams). Over my bed is a moonroof that automatically opens to the night sky and right in the middle of it sits a dazzling full moon, like a luminescent pearl. I’m floating off/I’m floating into my dreams. Yesterday was the opening day of hunting season. All morning long the fields and woods around St. Clément echoed with the boom of shotguns blasting away at small birds. At breakfast, I asked Natacha what kind of birds the hunters were killing. “Pigeons,” she said, pronouncing it pee-JHANS. After breakfast I went to the salt museum, the Ecomusée du marais salant, in Loix. In order to avoid the hunters, I rode my bike through the Lizay forest, a protected bird sanctuary. It was cool and silent here, the pine trees muffling the faraway boom of birds being blasted out of the sky. Once out of the forest, the paved trail took me past white stone houses with red tile roofs tucked behind waist-high walls of limestone. Every garden seemed to have fig trees, all busting with rich black fruit, and pear trees laden with fall-colored orbs. I rode past fields of wild fennel, the licorice smell mingling with the brine from the ocean, and brambles of blackberries and currants, also wild. There were even wild grape vines climbing willy-nilly up the trunks of the forest pines, spilling thick clumps of bright green fruit across the branches. 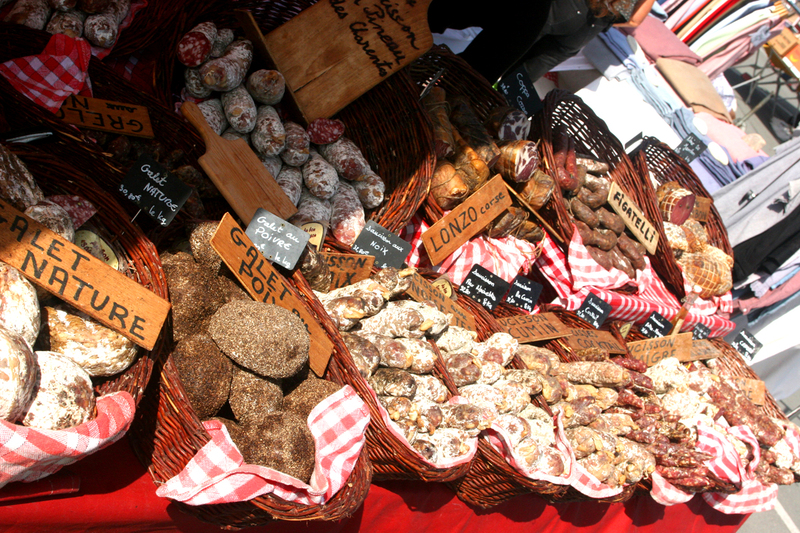 Then down through Ars where schools of cyclists darted left and right, ringing their bicycle bells as they hurried towards the morning market where they wove through shoppers nibbling on samples of Emmental, saucisson alla fleur de sel, and brined olives. Atop mounds of ice were just-caught sardines, lobsters, sole, and, of course, oysters. 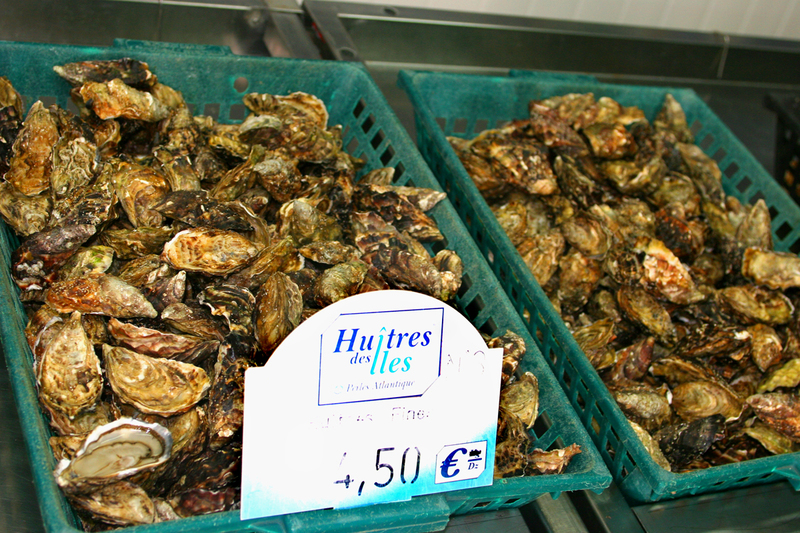 Bushels and bushels of oysters, the delicate ones labeled fin and the fat, juicy fin de claires. At least a dozen vendors were selling the island’s famed salt. It is either gray (called gros, from the clay of the salt pond) or pure white (fleur de sel) and comes in plastic bags mixed with herbs—basil, parsley, fennel, thyme—or in little crock pots with wooden spoons attached. People on the island have been farming the salt since the Middle Ages. And then, about 20 years ago, the industry died out. The salt farmers couldn’t compete with the commercial producers. But in order to process salt on a large scale, chemicals are needed to make the salt edible. And the salt ends up bland or with an unnatural taste. So 10 or 15 years ago, people on the island started working the salt ponds again. They found that there were people who would buy their salt because it was naturally produced, without chemicals, and they liked its taste. Now there are almost 100 salt workers on the island, most of them young people. I’m wondering if Natacha has any friends who work in the salt ponds. There is a corpulent man at the Bistro Marin in St. Martin, his arms folded across his thick chest, sleeping with his nose almost in his beer. Along the sea wall, couples walk slowly, aimlessly. They sit on green benches looking at the ocean, arms wrapped around each other, not talking. Reluctantly they stand up, return the way they came, always looking out to sea. Everyone here looks longingly out to sea. Here is the thing: I have fallen in to doing nothing on Île de Ré. I find a bench and sit for awhile—facing the ocean—and then move on. To a café where I order a glass of the local white wine, Le Royal, and breathe in the marine air. I sit on the seawall watching the fishermen with their long poles. Or the kids diving from the old fortress wall into the ocean. Hours pass this way. Sometimes I have to force myself to move. Even if only to another bench, another café chair. Soon I may not have the energy to leave Île de Ré. Today I ate three dozen oysters. Is that a lot? I don’t think it’s a lot. I did not eat them quickly or carelessly. I ate them thoughtfully. Thinking of Tony and the three years the oysters have been nourished by the sea in the calm days of late August and the blustery cold of January. I chewed them. Which some people can’t stand. But chewing them releases the oceanic terroir. The slippery rocks, sandy bottoms, clay minerality of their existence. 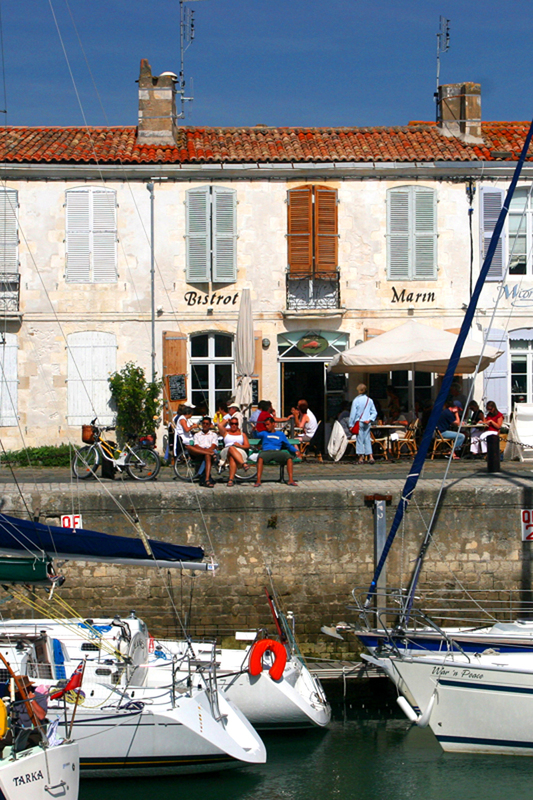 You chew, sip the local blanc de blanc, and then look out at the sea. And you understand in a way you cannot when you order a dozen oysters on the half shell as an appetizer at some chichi restaurant in New York what it is to be connected to the land and the sea. It took me coming all the way over to this little speck of an island off the French coast to learn this. But is feels like a valuable lesson.